I don’t know why I worry, only that I do. And that I have strange ways of attending to my phobias. For one I put myself out there, but I also make a spectacle. I took too long to choose an inter tube, and when I did my selection was curious. As we were some of the first people in line we had our pick of the litter! With so many tubes so late in the season it might be rare to find one in pristine condition but Moira and Angela found the brightest of blue tubes. Karleen, likewise, found one in a ruby shade of red, and I… without being able to explain myself chose the oldest, most faded, saddest looking tube in the lot. It operated and seemed as air filled as the rest, but this tube would never photograph well. This tube was probably the tube everyone left behind – statically growing into it’s shade of grey by way of hiding. It was a tube that spoke to my feelings and I dragged it along like I’d trained it in my own image. Up the magic carpet we went – four lasses on a mission to enjoy what was left of these winter days. At the summit Karleen raced ahead and almost threw herself down, while I lingered behind, dragging my inner tube in figure eight patterns on stamped out snow. There was an employee who eyed Moira and I and asked if we were ready. “Is it scary?” I asked. “If you can’t traffic will stop you” another employee offered. With that the first employee who promised me fearless fun shushed his colleague and told me I could go with my friend. He lined us up together and had me hold onto Moira’s tube handle, and her mine. Before I could again ask (for good measure) if I’d hate the experience he wished us well with one big push. WHAT THE WHAT? Queue screams. Now for those of you who regularly ski or tube or do things of the extreme variety my rehash may elicit a laugh. But this was EXCITING for me. Me who likes to plant herself firmly on the ground. Me who self identifies as a ‘cautious adventurer’. And perhaps because I’m such a controlling sort and didn’t have time to deconstruct my expectation or qualify my fear – maybe because the dude at the hill top did me a solid by disallowing any escape plan – well, I had no choice but to feel something new. I screamed and screamed as we careened down the hill, hitting bump after bump, my winter cap falling further over my eyes. As soon as it starts it’s over, and responsibility sets in. I am moving quickly down a hill, I realize. If I don’t slow down I will know this snow. I must slow down. I must let go. And I did, dragging my feet, creating micro snow storms in my wake. And while I heeded his words, and while nothing bad came of me, I wanted to hold on a little longer. I wanted to feel the rush of the chase if only for a moment more so as not to let go. Once you stop a new sensation sets in. My first inclination was to call it a day. Recognize that I do not like the sensation of being out of control and be proud of myself for trying. This would harken back to my attempt at trapeze swinging, or failed efforts to ride a roller coaster. But something was different with this. 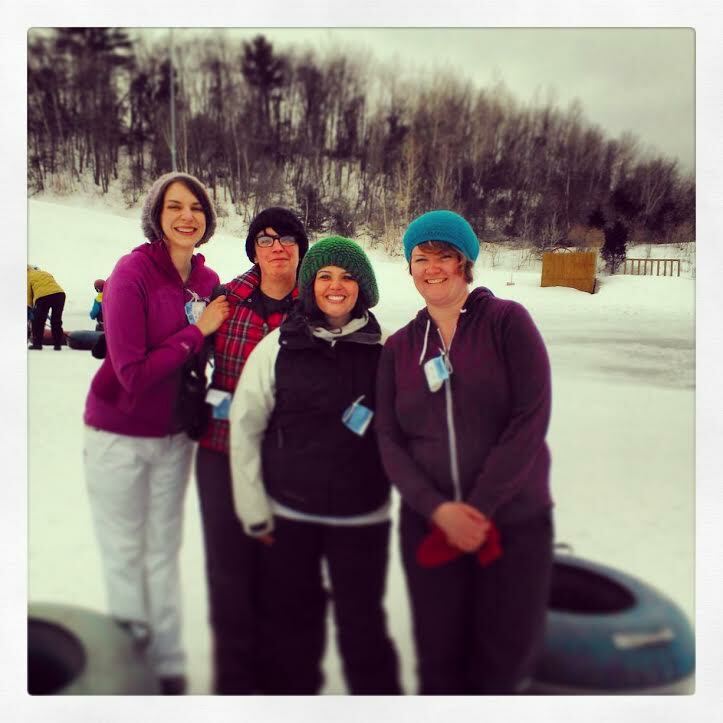 Was I growing my brazen, or might snow tubing be my sport? Because for whatever reason – the tube being close to the ground – the ease of flight – I was into it. I wanted to go again and again, and so we did. Up and down the magic carpet until the employee who earlier thought me a wimp made every effort to spin our tubes as fast as possible so that we were airborne, truly one with the wind on our successive flights down. I was even so bold as to YOLO my experience and declare that I was going to try what the kids promised. I was going to go head first! WHO WAS WITH ME? Only to find, that for once, I was the bravest. I was the only one willing to try something new when I usually lurk in the quiet corners of refuse. But wouldn’t you know that it takes a village. I wasn’t born with bravery. I am a product of my surroundings and rely on the comfort of my friends. While it is exciting to take on something yourself I’ve always found it best shared. What’s a story without a listener? So while I did not dive head first that’s not to say I never will. Now I know where to go. I have the snow cred and have excuse to share this with someone else. Who’s with me? I promise to hold firm. I promise to never let you go.